What's a good Christmas movie to catch this month? Just came back from the most delectable gift I gave myself this holiday season, watching Pedro Almodovar's latest film La Mala Educacion (Bad Education). Gael Garcia Bernal is as riveting as the young Antonio Banderas when he was the focus of the early Almodovar films. A genuinely intelligent film. Vamos! 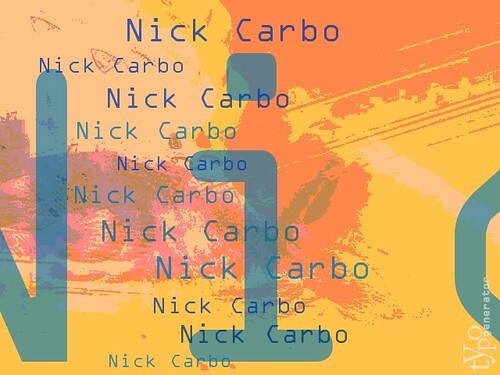 nick collage, originally uploaded by carbonator. I would like to congratulate our poet friend Dennis O'Driscoll on the publication of his watershed collection New and Selected Poems (Anvil Press, 2004). You can hear him read a couple of poems on the RTE radio show Rattle Bag. Today it arrived, the Monday, Dec 6 edition of the south florida Sun-Sentinel newspaper which has a groovy feature on Denise Duhamel and Nick Carbo in their Life Styles section. So, when I went shopping this afternoon at the local Publix supermarket the chatty checkout lady says "Hey, I saw you in the paper today. Your picture was so nice and I loved the poem you wrote about the horse and the snow and the dark woods. I could see all the details. I grew up in New England you know." Didn't have the heart to tell her that was a Frost poem she was remembering. But hey, if there is one supermarket checkout lady in south florida that even reads some poetry, that's a good sign. This weekend has been full of contemporary art, artists parties, gallery curators cocktails, and lots of vodka. The world famous Art Basel Miami Beach has taken over South Florida and Denise and I have gorged over all the exciting art happenings around town like Jenny Holzer's text projections on the downtown Freedom tower, Richard Tuttle's Splash in Allison Island, and Yoshimoto Nara's dog at Collins Park. We particularly liked the Arts Positions exhibition of avant-garde art in shipping containers along Miami Beach. The Video Lounge was also fun with stadium reclining seating. Can't wait for next year!